Glideways is a collaborative program aimed at conserving gliders and their habitat through the Great Eastern Ranges and its slopes. Gliders’ existence in Victoria is not secure; 2 of the 5 Victorian glider species are threatened and their once robust populations have declined dramatically over the past few decades, in a large part due to habitat loss and fragmentation. Glideways brings the many organisations working on gliders together, providing the support and science needed to ensure the conservation of these widely-distributed species. By looking after the needs of gliders, we are also helping many other species such as koalas and the endangered Swift Parrot. Fencing off and improving important Sugar Glider habitat along creeklines on farmland, as well as involving local primary students in building nest boxes. Providing more food for Sugar Gliders and other arboreal mammals of the Ironbark forests in the Bendigo region by increasing the forests productivity and diversity through ecological thinning and reducing water run-off. 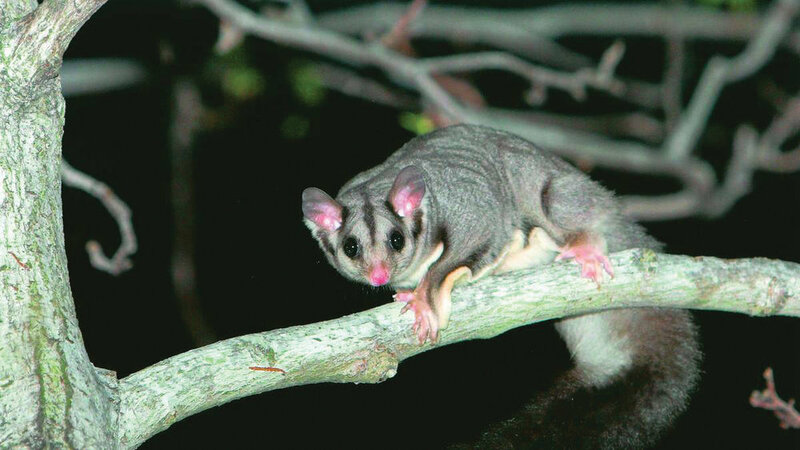 Developing survey and monitoring techniques that can be used by the local community to create a clear picture of Sugar Glider and other arboreal mammal populations in the Brisbane Ranges area. Night vision camera monitoring of threatened Greater Glider populations in the Wombat Forest. This is being done with many volunteers, greatly increasing the knowledge and awareness around these species. Teaching high-school students from the city about conservation by running Glider nest box building and installation days on private land in the Broadford region. Providing homes for Sugar and Squirrel Gliders by installing over 1000 nest boxes in logged Ironbark bushland and on private properties. The local community have been much part of this projects long-standing success. Protecting paddock trees and bush that are important habitat for Squirrel and Greater Gliders in the Strathbogie Ranges. Working with the community to protect old and important paddock trees and installing nest boxes for gliders. Revegetating corridors and stepping stones for Squirrel Gliders in the Lurg Hills near Benalla. In some sites gliders have been recorded in plantings after only 4 years. As the conservation and habitat requirements of gliders closely align with the broader needs of their local environment, the program helps to deliver the landscape changes we all seek. These include sufficient habitat free from weeds and predators such as cats and foxes, tree hollows (severely lacking in our regenerating forests and woodlands) and, very importantly, ongoing community involvement in management efforts and population monitoring. By taking care of the needs of gliders we are also supporting the other plants and animals with similar habitat needs such as Brush-tailed Phascogales, Koalas and woodland birds such as the Swift Parrot, Hooded Robin and Regent Honeyeaters. Glideways is a program of the Great Eastern Ranges initiative.